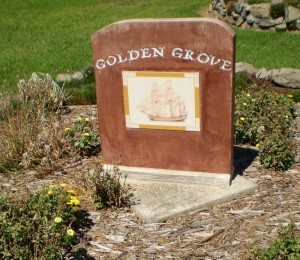 Built in Whitby in 1780, Golden Grove was one of the three store-ships that were owned by Leighton. She weighed 331 tons, with 5’6” height between decks afore, 5’5” midships and 5”1” abaft. The store-ships, Borrowdale, Fishburn and Golden Grove were men of war and transports; they had stored in every part, provisions, implements of agriculture, camp equipage, clothing for the convicts, baggage, provisions for two years and such other articles as were considered necessary to a colonial establishment. Golden Grove was under the command of Master William Sharp; Master’s Mate John Hart, Stephen More steward with a possible crew of 20. Whilst on the voyage in October 1787, Master Sharp became seriously ill, forcing him to send for Surgeon Bowes aboard Lady Penrhyn. 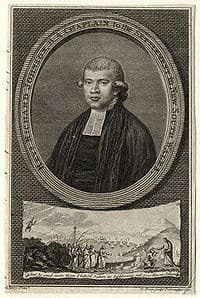 Passengers on the Golden Grove were the Reverend Richard Johnson and his new bride Mary nee Burton, whom he had married in St John’s Clerkenwell, London on 4 December 1786 and Johnson’s personal servant Samuel Barnes. On the voyage Johnson preached to the convicts on several transports, and baptised children born on board. He also distributed small comforts such as combs, probably from his own stores. At Cape Town he performed religious services for as many as he could. In one of Rev Johnson’s two letters home, he says when the ship was staying at Rio de Janeiro he bought oranges and saved the seeds. From these seeds, the first oranges were grown in the new colony. While in Rio, Rev Johnson officiated following the birth of a baby to Jane Scott, wife of Marine Sergeant James Scott who wrote My Wife was Deleved of a Daughter at one OClock PM. After being Ill 27 hours. The Reverend Mr Johnston Came On Board & Chrisned, My Child. was not without its mishaps, as during bad weather Golden Grove damaged her fore topgallant mast on three occasions. Calls were made at Tenerife, Rio de Janeiro and Cape of Good Hope, were most of the livestock was bought and loaded aboard the ships. Tench described the occasion. The live animals we took on board on the public account from the Cape, for stocking our projected colony, were two bulls, three cows, three horses, forty-four sheep, and thirty-two hogs, besides goats, and a very large quantity of poultry of every kind. A considerable addition to this was made by the private stocks of the officers, who were, however, under a necessity of circumscribing their original intentions on this head very much, from the excessive dearness of many of the articles. Eighty-eight years later, The Mercury (Hobart Tasmania) Saturday 17 June 1876 under the heading New South Wales, wrote this interesting article on a cat bought to the colony by Golden Grove. At Gundagai, N.S.W., there is in existence according to the Tumbarumba correspondent of the “Border Post “a cat which is said to have attained the extraordinary age of 100 years. 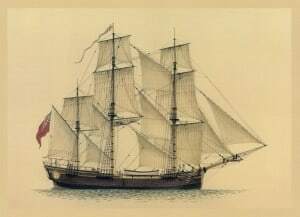 It was brought from England in the Golden Grove, one of the three storeships that accompanied the first fleet of convict ships, which cast anchor in Botany Bay on the 20th January 1788. This vessel maybe characterised as the Noah’s Ark of Australia. She conveyed thither – one bull, four cows, and one calf; one stallion, three mares, and three colts; one ram, eleven sheep, and eight lambs; one billy-goat, four nanny goats, and three kids; one boar, five sows, and a litter of 14 pigs; nine different sorts of dogs; and seven cats, including the Gundagai, which is supposed to be the sole survivor of the magic number seventy-seven quadrupeds brought by the Golden Grove. The cat passed into the possession of a pensioner of the Imperial Government, who settled in Gundagai in 1839, and who was drowned in the local deluge of June 1852. Since then – 24 years – this wonderful cat has subsisted on pork sausages, and will not touch any other diet. In the evening of the 26th the colours were displayed on shore, and the Governor, with several of his principal officers and others, assembled round the flag-staff, drank the King’s health, and success to the settlement. In the February carpenters from the Golden Grove were on shore helping to build storehouses for the garrison in compliance with an order from the Governor. By July two storehouses were finished, and the Golden Grove and Fishburn began landing their stores and provisions. The building of the storehouses had delayed the ships departure for home. On Tuesday, 8th September the Governor sent for the Captain of the Golden Grove. He told him to prepare for sea to take a detachment to Norfolk Island. The Governor again ordered the Golden Grove to proceed to Norfolk Island under the direction of Mr Blackburne, master of the Supply Collins recorded the event: On the 30th one midshipman and two seamen from the Sirius, one sergeant, one corporal, and five private marines, and twenty-one male and eleven female convicts, embarked on board the Golden Grove for Norfolk Island, and teh day following she dropped down, with his Majesty’s ship Sirius, to Camp Cove, whence both ships sailed on 2nd October. Golden Grove arrived on 13 October with 18 monthss provisions for the island, and five private marines off the Sirius, four free men, 21 male convicts and 11 female convicts. This increased the population by a further 41 persons. Before the ship left the Island, letters were delivered aboard from Lieutenant King who wrote in very favourable terms of his young colony. A lower yard and top-gallant mast for herself and Fishburn was also delivered aboard. When she dropped anchor in Sydney Cove on 10 November, Golden Grove had been absent for five weeks and four days. The two store-ships, Fishburn and Golden Grove weighed anchor on 19 November and departed Port Jackson for home, leaving the Supply and Sirius in Sydney Cove. Keeping together the two ships sailed past the north coast of New Zealand and around Cape Horn. 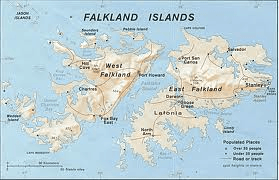 Stopping off for provisions in the then Spanish possession, the Falkland Islands, Golden Grove and Fishburn stayed at anchor for nearly a month, to give sick crew members time to recuperate from scurvy. The ships then sailed directly to England; on sighting Cork in April 1789, Golden Grove lost sight of Fishburn when the Captain of Golden Grove landed the despatches. Golden Grove arrived at Deptford on 9 June 1789 having made one of the fastest passages back to England. After returning to England, she was registered in Newcastle in 1793 and on 12 January 1799 the registration was transferred to Liverpool, before being put on the Liverpool-Jamaica run. In 1804 Golden Grove was re-registered in Liverpool and then she disappeared from the records. is an outer north-eastern suburb of Adelaide, South Australia. The suburb was founded by Captain Adam Robertson, who named it after the last ship he commanded.